Hotel Best Western Marais Bastille, Paris. 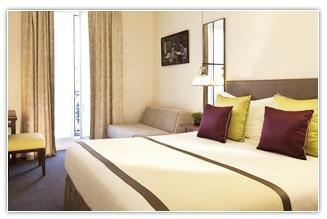 Best Western Marais Bastille Hotel Paris. A welcoming, elegant and charming hotel characterized by numerous comforts and located in a splendid situation, the Marais, at a few steps from Place de la Bastille, in the heart of the capital: the Best Western Hotel Marais Bastille is ready to give you a warm and personalized hospitality with a unique staff always at your disposal, in order to give you the best suggestion concerning what to do and visit during your permanence. Perfect both for business or pleasure trips, you can enjoy refined, elegant and accurate atmosphere with Arty furniture, which give a contemporary touch to the ambience. As the structure, also our rooms, which are real heaven of peace, represent spacious and luminous ambiences, perfect for your relax. In the hotel you can enjoy the free Wi-Fi internet connection, as well as newspapers and magazines. The situation of the hotel is strategic: at a few steps from the lively bars, restaurants, brasseries, all the charm of Place de Vosges, del Marais with its antiques and art shops, Place de la Bastille for unforgettable evenings.